06:30:00 Makes 8 servings, 1 cup (250 mL) each. 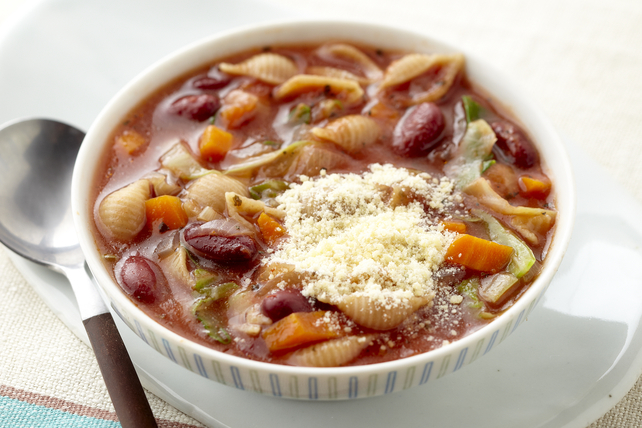 This warming soup is chock-full of vegetables and just perfect for a cool day. Heat dressing in large nonstick skillet on medium-high heat. Add onions, celery and carrots; cook 2 min. or until crisp-tender, stirring occasionally. Spoon into slow cooker. Stir in all remaining ingredients except pasta and cheese. Cover with lid. Stir in pasta; cook 10 to 15 min. or until pasta is tender. Top with cheese. Serve with crusty bread and a tossed garden salad. Substitute white beans or chickpeas for the kidney beans. For extra flavour, stir 8 crumbled crisply cooked bacon slices into the soup just before serving.